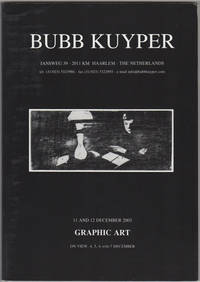 Haarlem: Bubb Kuyper, 2003. First edition. Paper wrappers. A fine copy. As new.. 110pp. Illus. with color & b/w plates. 8vo. 1270 lots: Commercial art, photographs, postcards, posters, Dutch topgraphy, maps, graphic art, Japanese prints, modern art. 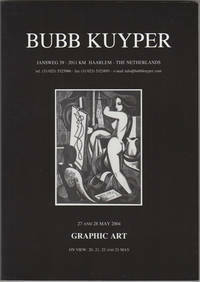 Haarlem: Bubb Kuyper, 2003. First edition. Paper wrappers. A fine copy. As new.. 110pp. Illus. with color & b/w plates. 8vo. 1658 lots of Commercial art, photographs, postcards, posters, Dutch topgraphy, maps,graphic art, Japanese prints, modern art. Coln a/R: Hermann & Friedrich Schaffstein, 1906. 35. bis 40. Tausend. Green and white illustrated paper-covered boards. Dark green illustrated endpapers. Rubbing with some minor loss at the extremities, rear board very lightly bowed, still overall a very good copy with exceptionally bright plates in original tan dust jacket with some spotting, soiling, edges worn and chipped, small hole at spine. Extremely scarce in original printed dust jacket.. Unpaged: , 24 pp., Adv. . 12 color illustrations plus title page. 4to. Bilder und Text Ernst Kreidolf. Swiss born Ernst Kreidolf (1863-1956) learned lithography in Emishofen and then attended the Kunstgewerbeschule and the Akademie der Bildenden Künstein in Munich. He worked in Germany until after WWI when he returned to Bern. His work was heavily influenced by Art Nouveau. The Swiss National Library lists the only copy of this edition [Aug. A: 35. bis 40. Tausend]. Hess & Wachter. A3.2.